EVOLAM is a laminated glass, consisting of one or two glass layers of the same or different thicknesses, laminated with one or more 0.38mm EVA foil interlayers. By varying the thickness and number of glass sheets and EVA foil interlayers, various levels of security can be obtained. EVOLAM can be used both indoors and outdoors and has a very high transparency index. EVOLAM glass can be processed for various applications, with various specific cutouts and holes according to the project’s requirements. Freefall protection – correct sizing and proper application of regulatory requirements, as well as correct calculation of the laminate glass thickness, give EVOLAM a residual stability in case of breakage as well as a retention of the body/ies that caused the glass to break. Intrusion protection – Laminated safety glass, mounted in an adequate frame, can be an essential burglary deterrent, helping to ensure the security of stores, homes, offices etc. 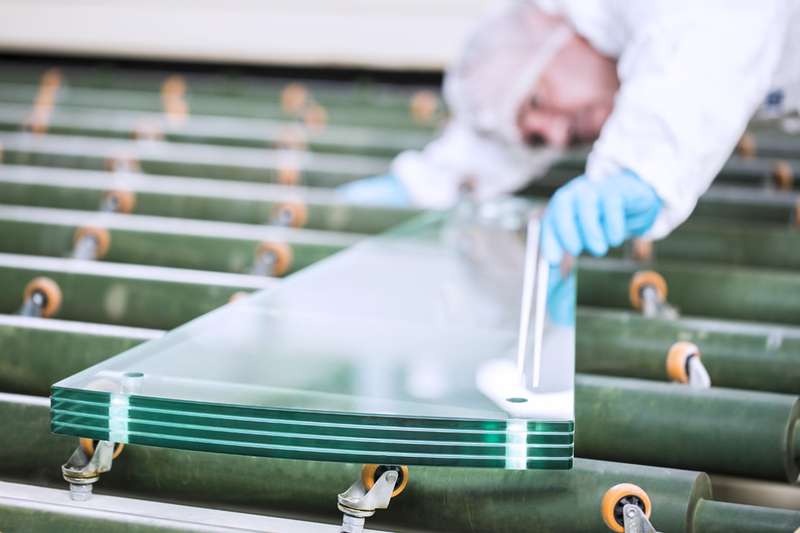 The evaluation of risk and regulations determine the level of protection to be achieved and therefore the type of glass that will be used.This choice obviously depends on the nature and value of the goods to be protected, the type of building (eg: easily accessible or not, individual dwelling, etc.) and location (eg isolated or not, high/low risk area, etc).The assessment of this risk will be done on a case-by-case basis and any insurers’ requirements will be taken into account. Vandalism Protection – certain devices and appliances, works of art, etc. must be protected against vandalism. Due to its breakage properties, in the case of vandalism EVOLAM glass remains fixed in position, making it practically impossible to reach the protected item. An example of this aspect would be glass that is placed over the displays at ATMs or paintings, for instance. Protection against armed attack – laminated safety glass protects against the risk of assault with a weapon or firearm. This is classified according to the type and degree of protection required, and according to the armament and ammunition used (and also whether or not any shards can be projected from the opposite side of that impacted). Protection against noise pollution – Besides the innovative, colourful, opaque or semi-opaque interlayer options available, EVOLAM also offers other special types of laminated foil interlayers which can provide acoustic insulation or noise protection in busy environments. UV protection – EVOLAM laminated glass reduces ultraviolet penetration by approximately 90%. Therefore, EVOLAM laminated glass is used for shop windows to protect against the discolouration of exposed clothing. 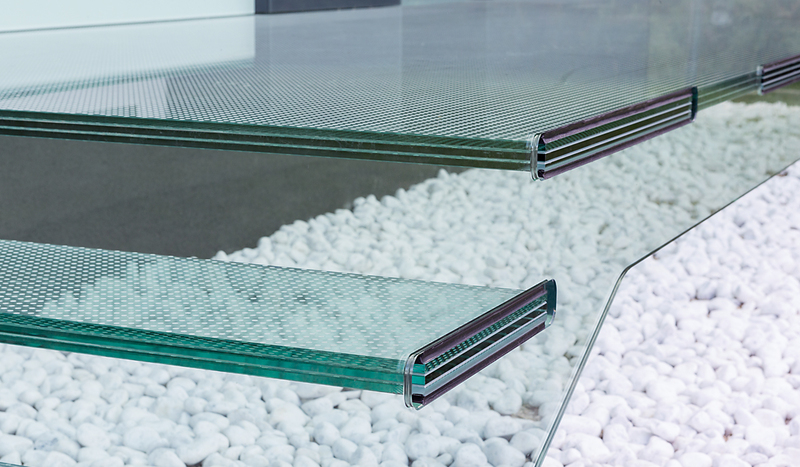 – EVOLAM – made from two or more ultraclear (low iron) glass sheets, in configurations from 8.8.2 to 15.15.15.4, this glass is suitable and widely used for large, thick glass floors and glass stairs, glass railings etc. 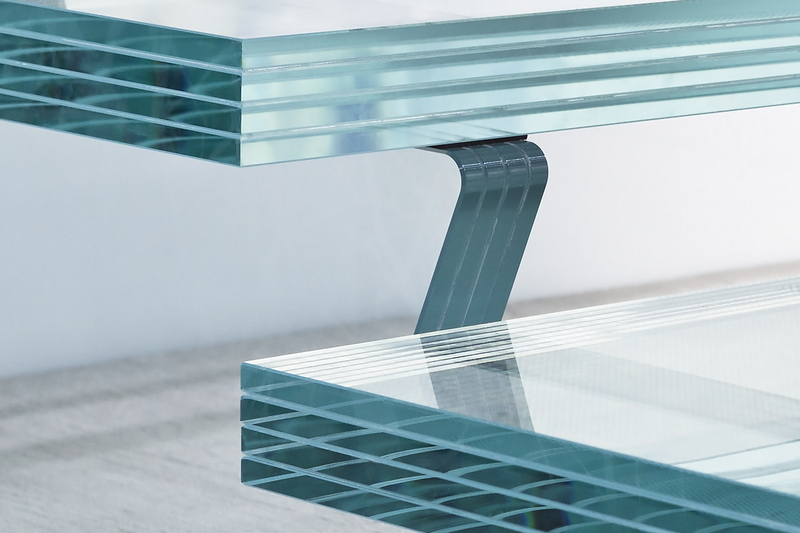 – EVOLAM T – laminated glass made from two or more EVODUR tempered or EVODUR semi-tempered glass layers, or combinations of them. EVOLAM T laminated glass is used especially for glass railings, stairs, flooring, especially where increased mechanical resilience is required. – EVOLAM K – made of two or more glass sheets with one or more coloured EVA foil interlayers. This produces a colourful translucent laminated glass or, if required, coloured opaque glass. – EVOLAM DESIGN – two or more sheets of laminated glass, of the same or different thicknesses, between which various elements have been inserted during the laminating process. The materials inserted can be diverse, from natural elements (leaves, grass, natural veneer), to marble tiles, metal sheets, gold foil, newspapers, architectural plans etc. – EVOLAM SMART – two layers of glass, of the same or different thicknesses, with a liquid crystal sheet insert. Consisting of a matrix of liquid cells that become opaque or that change colour under the influence of an electric current. The foil becomes translucent or opaque, as determined by the EVOLAM SMART switch. After manufacture, EVOLAM laminated glass can no longer be tempered or enamelled. However, it can be drilled, organic paint can be applied and it can be sandblasted. EN 14449 – Laminated glass and laminated safety glass. Evaluation of conformity/ Product standard.